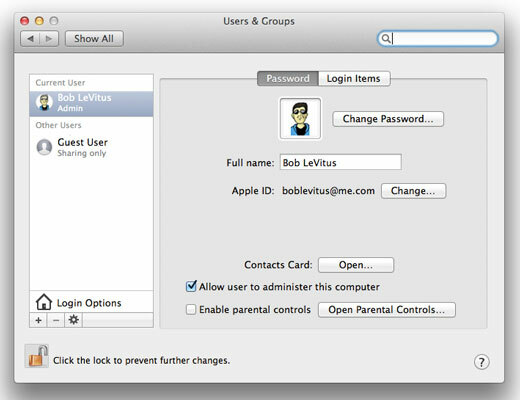 1Choose Apple→System Preferences (or click the System Preferences icon in the Dock), click the Users & Groups icon, and then make sure that the Password tab is selected. 2Click the + button beneath the list of users. A sheet appears in which you enter the new user’s information. 3Choose Standard from the New Account menu. If the + button was dimmed, here’s how you get it functioning: First click the lock (at bottom left), supply an administrator name and password in the resulting dialog, and then click OK.
4In the Name text box, type the full name of a user you want to add. 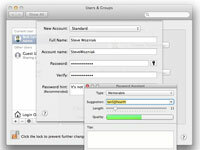 In the Account Name text box, your Mac inserts a suggested abbreviated name (formerly known as the short name). 5Press the Tab key to move to the next field. OS X suggests an abbreviated version of the name in the Account Name field. 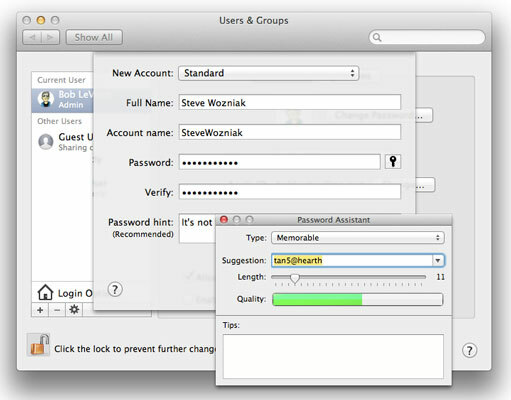 Users can connect to your Mac (or log in from their own Macs) by using the short name, rather than having to type full names. The short name is also used in environments in which usernames can’t have spaces and are limited to eight or fewer characters. Although OS X Mountain Lion allows longer usernames (but no spaces), you might be better off keeping your short name shorter than eight characters. 6Tab to the Password field, and enter an initial password for this user. 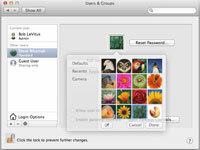 The small, square button with the key to the right of the Password field, when clicked, displays the Password Assistant. You can use the Password Assistant to help generate a password that should be fairly easy for the user to remember (choose Memorable from the Password Assistant’s Type pop-up menu) but hard for a cracking program to guess (or meet other requirements). 7Press the Tab key to move your cursor to the Verify text field. In the Verify text box, type the password again to verify it. 8(Optional) To help remember a password, type something in the Password Hint text box to jog the user’s memory. A password hint should be something simple enough to jog the user’s memory, but not so simple that an unauthorized person can guess. Perhaps something like “Your first teddy bear’s name backward” would be a good hint. 9Click the Create Account button to create the account. 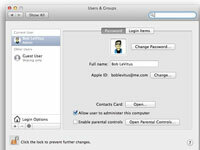 The sheet disappears, and the new user now appears in the Users & Groups System Preferences pane’s Users list. 10(Optional) Click the account picture above the Full Name field, and choose a different one. 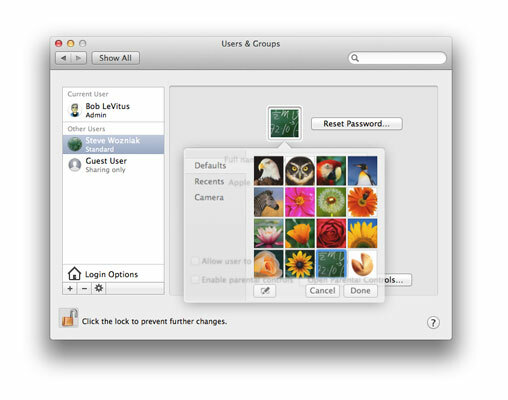 OS X suggests a picture from its default collection for each account, but you can select a different one from the pop-up mini-window, drag one in from the Finder (or iPhoto), or take a photo with an attached or built-in camera (such as an iSight) by clicking the Edit button (shown in the margin).